I've finished the first three books from my Library Roulette and I couldn't be happier. I've learned so much, which is exactly what I was hoping for. Before I even opened the book, I looked up the definitions of numismatics and sigillography. I knew that numismatics was the study of coins/money, but I didn't know there were sub-branches that include the study of medals and tokens. I had no idea that sigillography was the study of seals (as in, impressions made in wax/clay to seal something, not marine mammals). 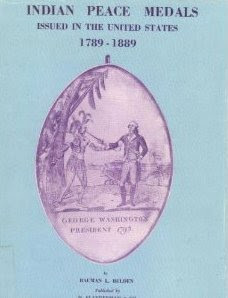 This book, originally published in 1927, was intended as a complete reference for all of the peace medals given from 1789-1889. The inside of the book looks a lot like the cover: a picture of a specific medal with text to explain more about it. Reference books are not generally meant to be read from cover to cover, making it a somewhat poor choice for my goal. While I can't honestly say I enjoyed the book at all, I can say that I learned something. "Tookie" Williams, cofounder of the Crips gang, was a death-row inmate in California's San Quentin prison for 21 years. While in prison, he wrote many books for children advocating peaceful lifestyles and imploring them to avoid gangs. This book, a very quick and easy read aimed toward preteens, gives a candid look at exactly what life in prison is like. He talks about the food, the daily schedule, the rules, and the punishments. He talks about the homesickness, the complete lack of privacy and the daily strip searches. He provides a very convincing argument of why you would want to avoid going to prison. The book was fascinating and introduced me to a world I knew absolutely nothing about. Clearly, I am not Tookie's target audience. I'm not (and never was) an 11-year old living in a rough neighborhood, surrounded by gang members, with many friends and family in prison. But a few of the students I taught over the years were. As I read this book, I thought of them, hoping and praying that they avoided gang life and prison. As I read, I also thought of the Correctional Officers I know. I have a good friend whose husband is a CO at San Quentin. He doesn't talk about work often or in any detail (though it's worth pointing out that I only see him when our kids are around). He's described work as "long stretches of boring with the occasional excitement... and excitement is never good." I'd love to hear about life in San Quentin from a CO's perspective and I'd love to hear a CO's opinion of this book. Let me start with my religious background. I was baptized into the Lutheran Church (ELCA) when I was around 6 weeks old. My parents were (and still are) active in the church, attending worship weekly, volunteering for various ministries, and socializing with other members. My sister and I went to the Lutheran preschool affiliated with our church. (My mom taught there from the time I was around 7 until her retirement a few years ago. Now she subs there. I helped her with a lot of the prep work growing up.) I attended Sunday School from preschool until I was confirmed as a member in 8th grade. During my childhood, I was also very active with Awana through a neighbor's Baptist church. Now, I'm raising Trevor as a Lutheran. We attend church and Sunday School most weeks. I mention this to point out that I have had a fair amount of religious instruction in my life. Yet, before I read this book, I knew next to nothing about the 12 apostles (let alone who this mystery 13th apostle could be). I could name most of them and give a one-sentence summary about some of them, like the fact that Matthew was a tax collector and Andrew was a fisherman and Peter denied Jesus three times before the rooster crowed. But that's it. This book is organized with 13 chapters, one for each apostle (including the 13th "replacement" apostle). Each chapter opens with the instructions to read a particular passage from the Bible. The author chooses a defining characteristic about each man and explores how it influenced him as a disciple, why Jesus might have chosen him, and/or what role people with those characteristics play in a modern congregation. The book is easy to read and very accessible, even to those with little background in Christianity. There is a study guide at the end of the book with summaries and discussion questions. I really this challenge Cindy. I think it's so neat that you're reading such a diverse set of books! Thanks for the recommendations. Thanks for the great reviews Cindy!!! That second book sounds really interesting! Awesome, Cindy! I was born and raised Lutheran, too. We just recently started going to our neighborhood Baptist church, too. I am very much inclined to read the last 2 books on your list! Thanks so much! I'm so glad you came back and gave a "book report" -- so interesting! :) Glad you are enjoying your challenge too! !